Harvard Scientific is the leading provider of low cost state-of-the-art in house waveguide technology, focused on rain fade and snow interference at the 12-26 GHz range enhancing high quality digital cable TV. You can reach us by phone at 617-876-5033, or reach us via email through our contact page. - Maintenance and trouble shooting (available 24/7). High quality and rapid response to customer needs are our major objectives. 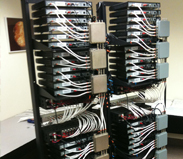 Harvard Scientific provides superior quality digital cable TV services based on a unique waveguide, which removes the signal interference often encountered during periods of inclement weather (rain and snow). We custom design digital cable TV packages to meet your needs, offering a wide choice of channels including high definition channels. We offer the most cost effective digital cable TV packages currently available. Costs begin at $4.75/drop/month; representing a savings of up to 75% off your current cable costs. This is an all-inclusive price with no additional fees charged and includes a warranty for our services.